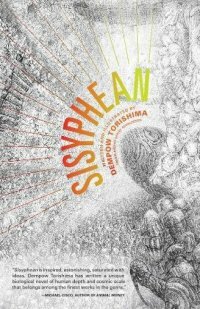 With this stellar debut volume–a “mosaic novel” depicting a world of infinite biomorphic perversity that feels at once surreal yet authentic; estranging yet welcoming; otherwordly yet familiar–Dempow Torishima gives the world a book of fantastika with very few literary precedents. Perhaps the closest correlative is the cult classic Moderan, by David Bunch, a long-out-of-print sui generis set of linked stories that has finally earned a New York Review of Books reprint due this summer. Both collections involve future scenarios or inexplicable laterally displaced milieus where both the planetary conditions and the human baselines have been co-evolutionarily warped. Both books involve the reader intimately and without preamble through instant and deep immersion in the warped yet consistent sensibilities of the viewpoint characters. And both books are tragicomic, featuring a mix of despair and humor, pathos and slapstick. But one major difference is that while Moderan is a book of cyborgs, with mechanistic motifs blending with the organic modalities, Sisyphean is nearly one-hundred-percent wet and squishy, with even the few inorganic bodily appurtenances like wires and screws seeming to have been grown rather than manufactured. This is a world where certain rude architectural constructs and interior furniture are about the only non-organic tech to be found. Everything else–like the household appliances in the Flintstones–is alive. We might fruitfully compare Torishima’s tortured, teratological world to the landscapes of the French film Fantastic Planet; the wasteland insanity of Kaz‘s graphic novels Underworld and Sidetrack City; and the genial psychedelia of Yellow Submarine. But really he has a lock on uniqueness. Here’s how the book is structured, and some prose samples to give you an idea of its flavor. Two things must be mentioned at this juncture: Torishima is also a talented visual artist who provides illustrations reminiscent of the work of Odilon Redon, an artist he confesses he admires (in an essential Weird Fiction Review interview). And the translator Daniel Huddleston cannot be complimented enough for his massive ability to bring Torishima’s myriad neologisms and instances of wordplay into English. The book features more such linguistic jollities than Riddley Walker, Barefoot in the Head and The Futurological Congress combined. The first section is titled “Sisyphean (or, Perfect Attendants).” We are introduced to a poor nonhuman office lackey named Gyo who lives and works atop a platform tower high above a mysterious sea. Gyo’s boss, “the president,” is a massive abomination: “Sticking out from the wide opening of its collar [of knitted muscle fiber] was an eyeless, noseless, mouthless, translucent head whose shape mimicked that of the office building itself.” The boss communicates in gibberish as he and Gyo undertake their tasks. “The worker jabbed his needler into a cross-section of slime-cake and injected the guidejuice. The president held out his thick fingers…and forced from their tips waybugs about the size of rice grains.” In short, we have Sladek’s “Masterton and the Clerks” as envisaged by H. R. Giger. Along the way, we begin to get a little backstory involving an enigmatic “Great Dust Plague” of nanoware. Our next chapter is “Cavumville (or, The City in the Hollow).” Here Torishima constructs one of SF’s typically strange constructs, much in the manner of Stephen Baxter (Raft) or Karl Schroeder (Sun of Suns). A deep funnel-like chasm features a city clinging to its inner walls, and a lethal bottom level. Our protagonist is a young “lad” named Hanishibe, and we follow him through the challenges typical of a maturing youth: the search for love and vocation. 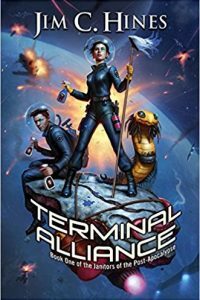 That’s a notable feature of this novel: no matter how alien the beings and environments are, they are relatable through shared aspirations and emotions and goals. Here too we first encounter the momonji, which are basically the shoggoths of Torishima’s world. “Castellum Natatorius (or, The Castle in the Mudsea)” is set in a realm of peripatetic, living fortresses inhabited by lesser species. Our hero is one Radoh Monmondo who functions as a kind of private eye, hot on the trail of a world-shattering secret connected with the nature of the castellae. Torishima has lots of fun with the conventions of the PI novel here. “‘Make it a ragerum,’ I said, ordering their second-strongest nectahol. Reluctantly, the owner took a shellite bottle down from the shelf, stretched, and poured some of the liquor into a cupshell.” You can imagine this chapter as Vance’s The Last Castle mated with a Steve Aylett novel from his Beerlight cycle. Each momonji had its three transparent eyes fixed on the backside of the momonji in front of it, and their giant bodies–reminiscent of coupée pão bread rolls, with their slight, gentle swells towards the front–swayed left and right as they crawled over unstable ground that was rolling with eidos waves. Ten pairs of claw-legs were arrayed in their undersides, which they used to pull themselves along guidelines that were laid out over the ground. These guidelines, made from twined fibers of momonji entrails, were indispensible for travel over the ever-changing Vastsea. Aside from following the harrowing exploits of Umari, one of the lesser workers in the caravan, we also get glimpses of a time close to our own era, just when the Great Dust Plague hit. And finally, our story reaches a hopefully apocalyptic climax of transcension and endurance. You might think of this ending section as Mission of Gravity rewritten by Cixin Liu. Torishima’s knotty, dense, hilarious, scary masterpiece is a book whose prose can be savored endlessly, and whose Kakaesque biopunk conceits prove that no strangeness which the universe can confer upon humanity will destroy the essential drives, loves and ambitions of the species.